Jiu-jitsu.News: For the first time ever Ukrainian fighter at the «Copa Podio»! Great news! 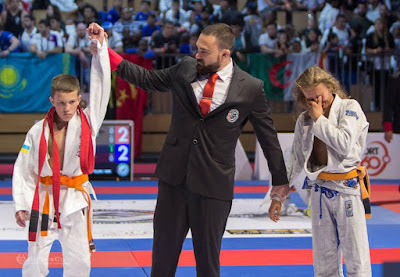 For the first time ever, representative of Ukraine, 13-year-old Igor Tenenyk from the SC “Borets” team, will take part in the prestigious jiu-jitsu championship of the “Copa Podio” organization. Participants from 13 countries will compete in the “Orange World League” series. The first stage of the championship will be held in February 2019 in Sao Paulo, Brazil. 16 participants will be divided into 4 groups. Sportsmen will fight with each other, and in the end, 2 fighters with the biggest amount of points will meet in the semifinals. “Copa Podio” tournaments were one of the pioneering professional jiu-jitsu promotions. These tournaments showed to the world such well-known sportsmen as Leandro Lo, Joao Gabriel Rocha, Tim Spriggs, Rodolfo Vieira, Victor Honorio, Travis Stevens, Felipe Preguica and many others.